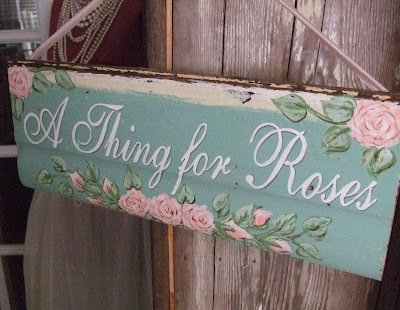 A Thing for Roses: Thank you to Sweet Natasha! Awhile ago I noticed on Stephanie's blog that she was setting up a new swap called, "I thought of you." In this swap you are partnered up with someone and you swap items that make you think of them. I was lucky enough to get the adorable Aussi, Natasha as my swap partner. I had so much fun putting together a box full of goodies for Natasha. We both love lots of the same things so it was pretty easy for me. You can see what I sent Natasha here. On Saturday I received my package in the mail all the way from Australia. I was so excited and strangely enough so were my kids. I found out later why. Here is what the box looked like when I opened it. 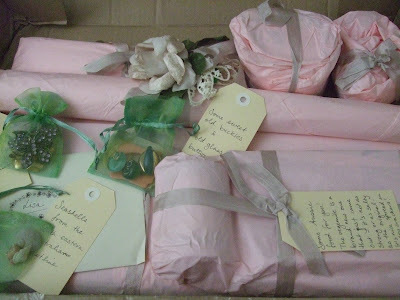 Inside those pink tissue paper packages were these goodies. 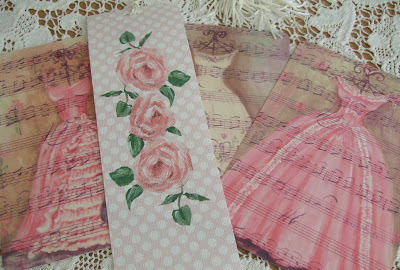 Lovely postcards of Natasha's ballgowns and a wonderful hand painted roses bookmark. 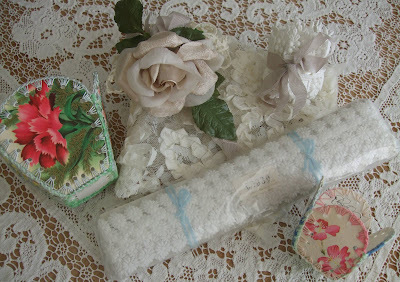 Cute little card boxes, vintage trim and velvety millinery rose. The most lovely vintage wallpaper ever! I have a couple projects in mind for these already. 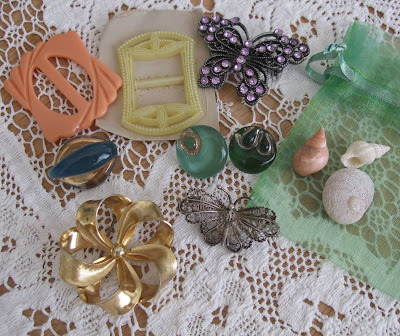 Sweet little vintage glass buttons, brooches, buckles and sea shells. My favorite is that silver filigree butterfly. Will be a perfect addition to my butterfly brooch collection. 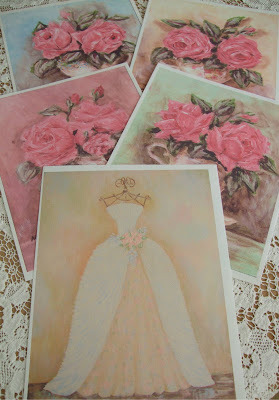 Gorgeous prints from Natasha's paintings. Ready for framing. A million thanks to sweet Natasha. I love everything she sent to me. This was such a fun swap to be part of. I'll have to keep my eyes open for more in the future. I have more fun vintage finds to show you later this week so come on back. Happy Monday! It's all so lovely! I'm a big fan of Natasha's and I admire her work and talent and it's so wonderful that you received some of her gorgeous creations and the sign is fantastic! I saw what you sent Natasha too and Holy Moly that was the jackpot of all swaps! Every thing you sent her was beyond gorgeous! I'm so glad you like the package Lisa! LOL about the vegemite - like I said, I sent you the new one, the one that is far more mild than the original. This one is pre-mixed with cream cheese or something, so it hasn't got that sour bite that the original vegemite has. Just think something savoury and salty, not at all sweet. Try it on a cracker with a nice slice of cheese..... lol! Lisa, what a wonderful package of goodies you received from Natasha...i have one of her gown paintings, and it is so beautiful...i love the sign she painted for you to use at shows...gorgeous!!! You really got some beautiful things from Natasha...you lucky girl! And you sent her some wonderful lovlies in return. I adore that pale green crepe paper you sent her! WOW...you two were really made for each other swap partners!! The sign she painted for you is so charming....it will really look great at your shows!! You really sent her some serious swap love as well!! Enjoy the rest of your evening!! hi! i just popped over from natasha's and am thinking -- i have to pop over here more often -- your blog is wonderful! the treats you both exchanged are awesome. this swap was the most fun. enjoy your goodies! It is hard to paint roses...I'm still trying. 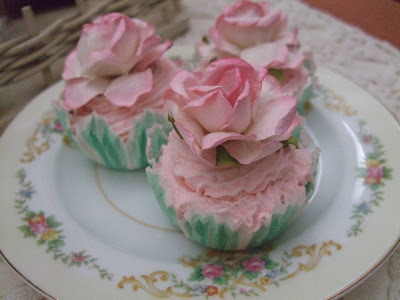 I just came over from Natasha's blog. I LOVE everything you sent her !!!! FABulous!! And your goodies from Natasha are beautiful also! I LOVE that sign :) She is so talented, isnt she? Boy you two BOTH scored! OMG!!! I just loooove all the pretty treasures Natasha sent you.. I love the sweet sign she painted you.. I also just adore her gown paintings. She really did think of you.. I also wanted to Thank you for joining the swap. Natasha is such a sweetheart! You are so lucky to have her for your partner! I love the sign! Lucky you. How sweet was that?? It's all awesome, and I LOVE the wallpaper! You received some lovely items but you also sent her some lovely things too. You two have very similar tastes. I love the sign that she painted for you. Beautiful combination of colors.